The project contains a list of user stories and issues. They can come from your customers, employees, buyers, your website visitors and other interested parties who are somehow connected with this product. Execution (delivery) of the project is carried out iteratively and incrementally, that is, delivered in parts at regular intervals (sprints). At the same time, each new iteration carries an increment of the product – a tangible and valuable result for the customer and interested parties. It can be an implementation of a new function that can be already used, or development of a prototype and so on. Title (1) – contains the name of your product or the purpose of the project. Project prefix (2) (or the project key) is a character–letter code that will be assigned to each issue, which allows you to identify which project it belongs to. Attention! This field must be unique – there cannot be 2 projects with the same key. Description (3) – contains the basic information about the Project. 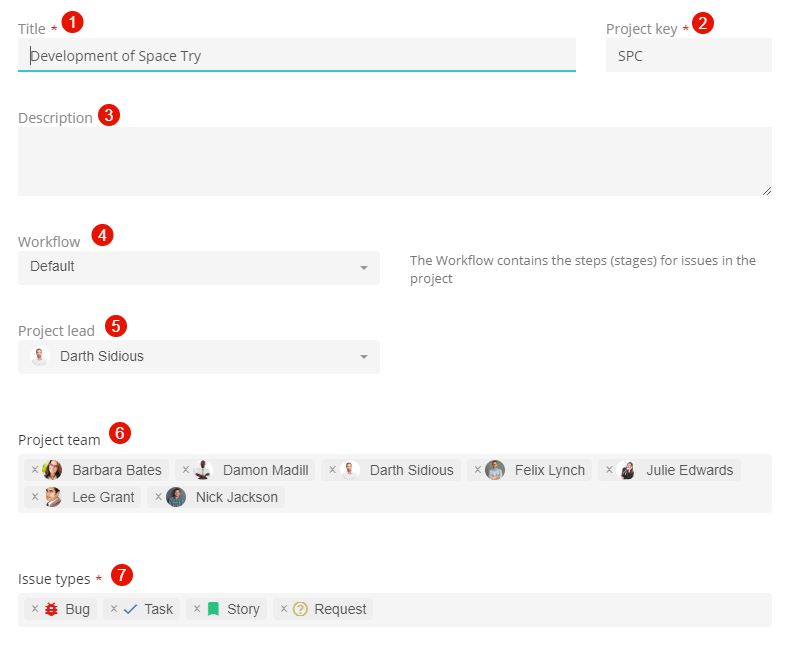 Workflow (4) – a set of stages that the issue goes through in your project before being considered completed. By default, there are 2 workflows in the system: standard and simplified. Read more about them below. Project lead (5) or Product Owner – an employee who needs to know the market, how a product or service is being produced, and customer needs. He should be a connection between business, clients, stakeholders (a wide range of persons related to the enterprise) and the project team that creates it. The main role of Product Owner is the management of the issues’ list (backlog of the product), their compilation and prioritization. The project team (6) are employees of your company who will work on the issues and deliver the product to customers. Issue types (7) are the building blocks of any Flowlu project. An issue can be a story, an error, a task. Read more about them further. Issue is a specific requirement for the product that should be performed (or should not, depending on the Project lead decision). Story (the user story) is a requirement for a product or service answering the question: "Someone needs something for something." Task – measured and final target. It can be the internal tasks of the team, which is purely technical, not having any direct value for the customer. Bug – a defect, remark on the product, which must be eliminated. Critical – applies mainly to bugs. The task with this priority should be completed as soon as possible, as it is of critical importance for the project, business and can significantly affect the project if it is ignored. Such tasks should be included in the current iteration, even if work on it is already underway (we will talk about iterations later). Blocker – the highest priority, defect or error that must be eliminated immediately, otherwise the consequences will be catastrophic. The estimate of labor costs (4) – a numerical expression in conventional units (story points, parrots, human–days, etc.) of the effort required to accomplish this task. On the basis of this number, the owner of the product understands what will be the cost of implementing this task for the team. We recommend using this ratio: 1 story point is 4 working hours. Category (7) – what summarizes several requirements into one large block. For example, the main page of the website, the facade of the house, the database, etc. Sprint (8) – an iteration, the time period in which this issue will be performed. Tags (9) – keywords that will help you find and understand the context of the given issue faster. Links (10) – connections of this issue with others. Links can be one–way (clone, duplicate) or two–way, when task # 1 blocks task # 2. Accordingly, task # 2 is blocked by task # 1. For example, you can not register on the website until you start the browser, so the registration task on the website is blocked by the task of launching the browser, and the task of launching the browser blocks the registration on the website. Links will help to build relationships between tasks and their relationship to each other. You can specify arbitrary links in the module settings. Workflow is the sequence of stages that the task in your project goes through before it is considered to be completed. By default, there are 2 preset types of processes: standard and simplified. 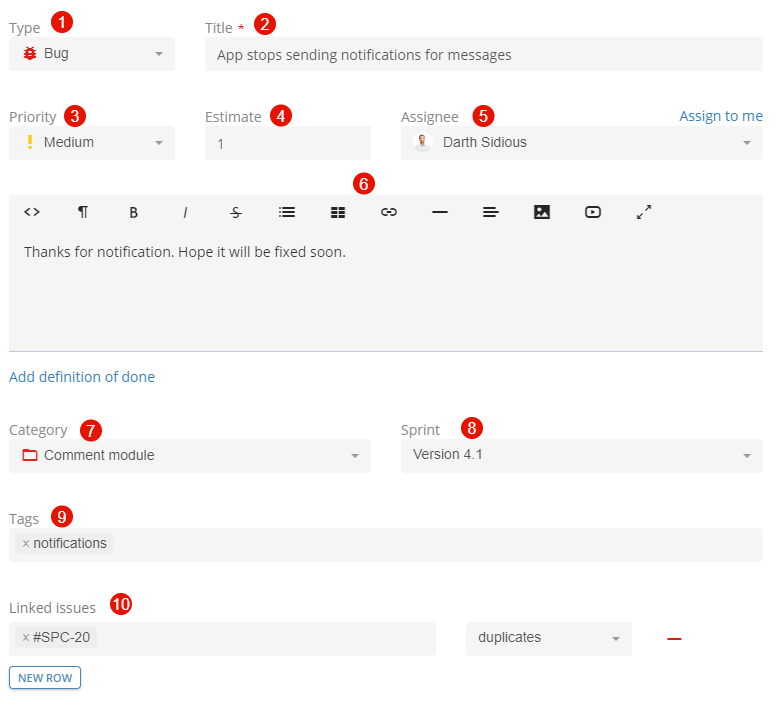 The stages are displayed on the Agile board in the form of columns. There are the global statuses which are set in Flowlu by default and assigned to each stage. The statuses have different color coding, which, respectively, are linked to the stages. 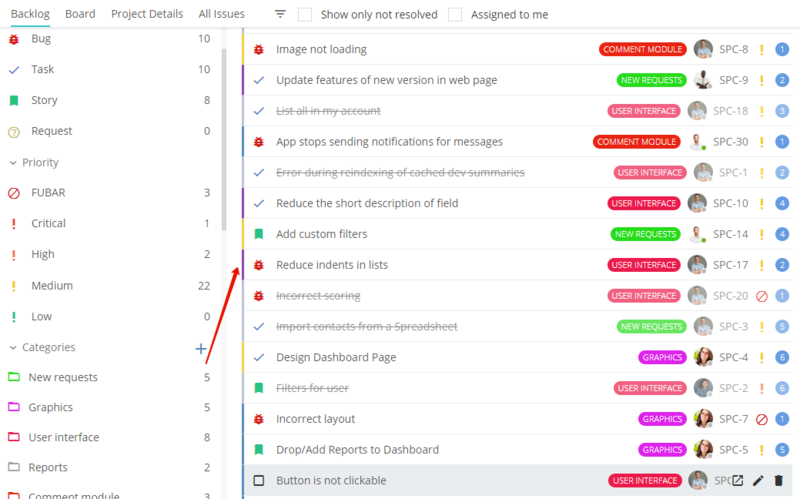 Color bars allow you to quickly assess the progress of work since there can be a lot of stages, but the number of statuses is always unchanged. Done – green color coding. At the stage with this status, the task is considered completed. We do not recommend creating more than one stage with this status. This is an entity that summarizes a group of issues. Allows you to categorize issues in the project according to certain characteristics and belongings. List of requirements for the project (product). Requirements are in accordance with the priority of their implementation. Backlog is regularly being reviewed, getting filled and re–evaluated by the product owner and the team. The main working tool Scrum along with the issues. This iteration of the delivery part of your project (product increment), which has clear time and scope limits (depends on the team's efficiency and performance). In the principles of Scrum, the sprint has a duration of 2 to 4 weeks, and its deadline cannot be changed after it starts.